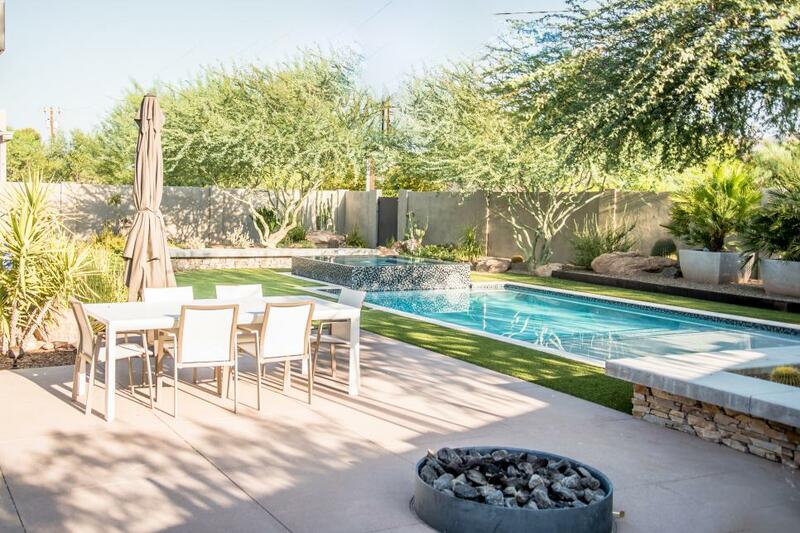 A large patio stretches alongside the swimming pool with plenty of room for a dining table and fire pit. Etched-finish pavers surrounded by a pebble border define each space, the living room and dining area. Weathered redwood slats are used to create an open ramada that provides shade from the hot Tuscon sun during the day. A large brick patio offers several areas to relax and retreat: A covered dining area is the perfect place for an al fresco dinner party. Enjoy chilly evenings cozied up to the fireplace. Or grab a favorite novel and kick back on one of the loungers. 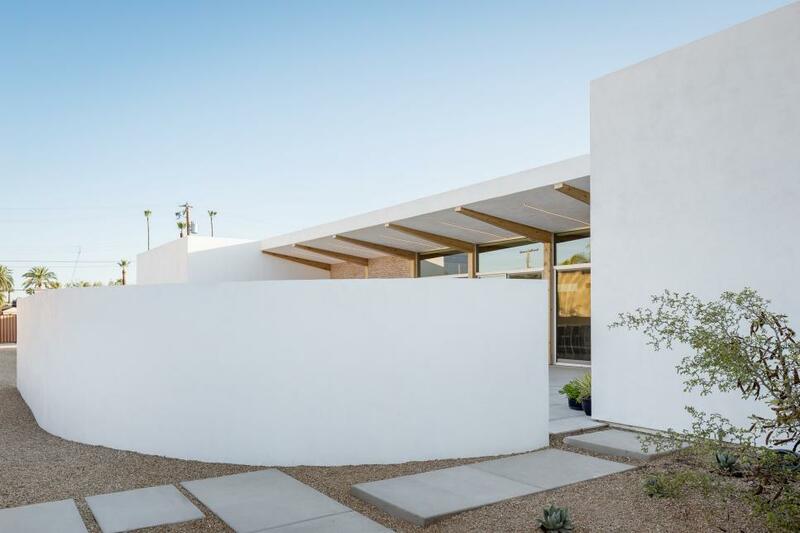 This Southwestern home boasts a backyard pool area with a white stucco privacy wall and concrete slab walkway. Neutral gravel provides groundcover. 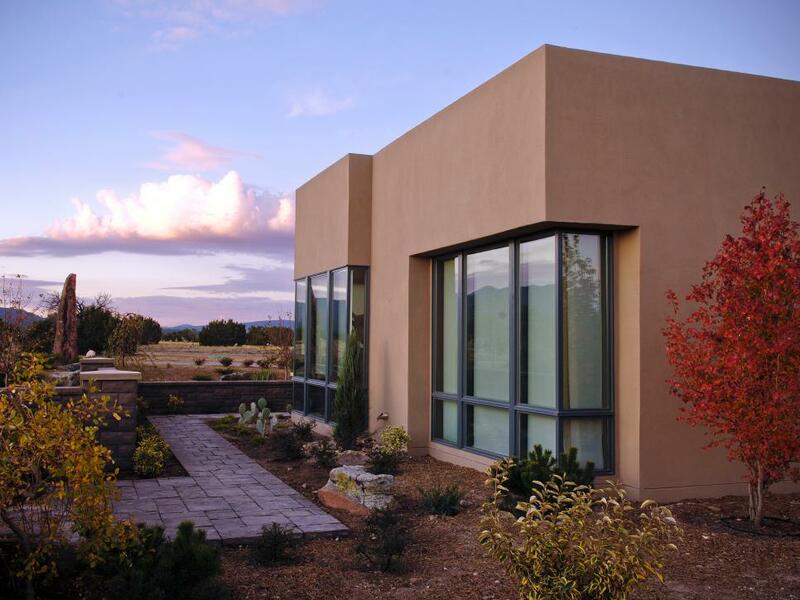 Stucco, tile and stone make up the exterior of this grand Southwestern residence. 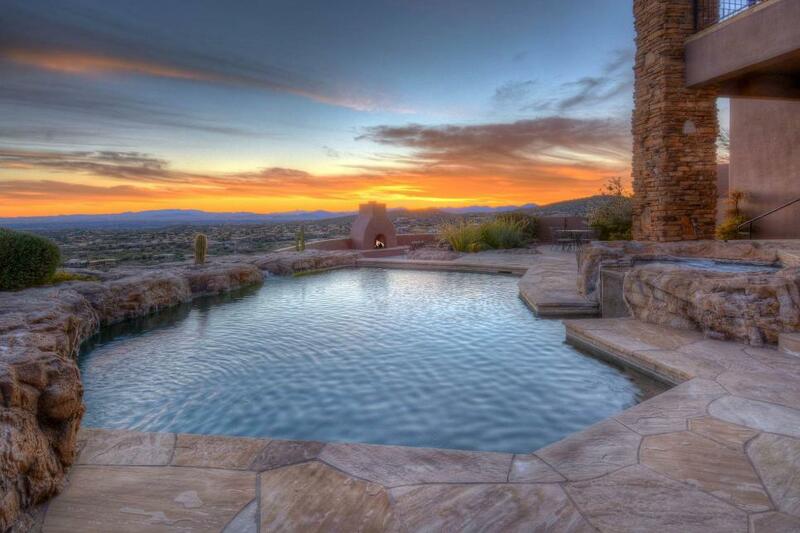 This striking infinity pool offers sparkling views of the mountains. 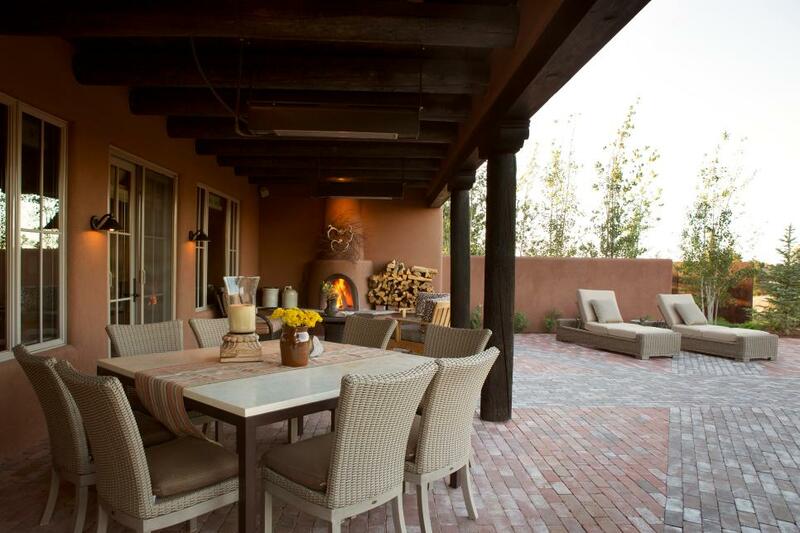 A covered patio anchors the space, creating a quiet and dream-like place to watch the sunset. A glass perimeter enhances the seamless indoor-outdoor relationship with the home. 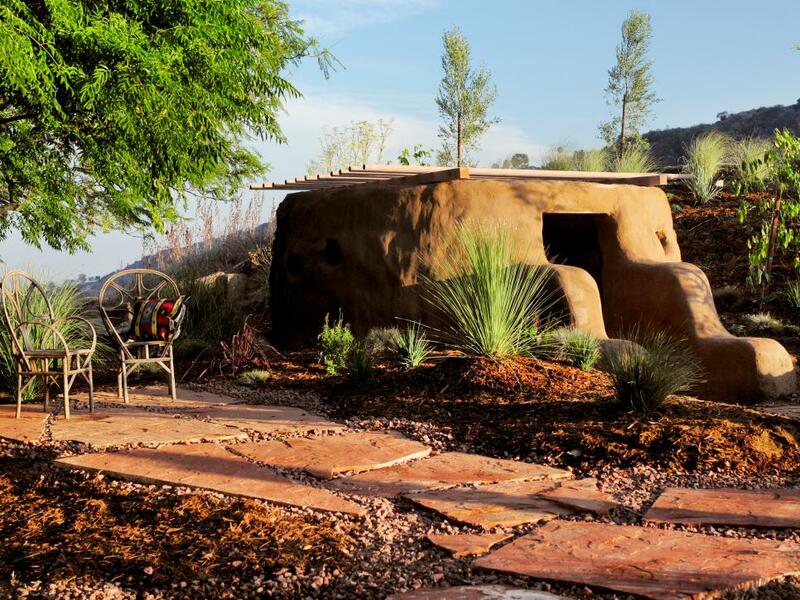 A flagstone pathway leads to a small patio area with a nearby adobe lounge in this charming Southwestern space. 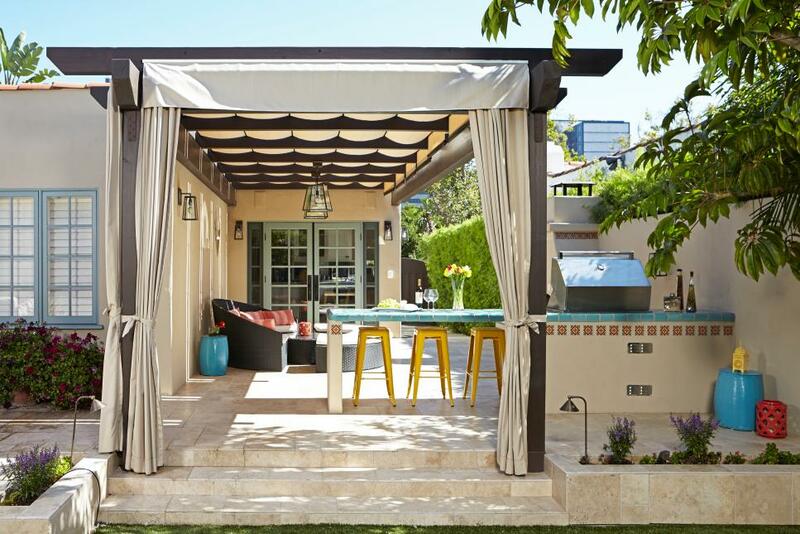 In this Sedona-inspired landscape, designer Jamie Durie used gorgeous roof tiles and stone to create a festive gathering spot that includes circular seating around the patio tree. 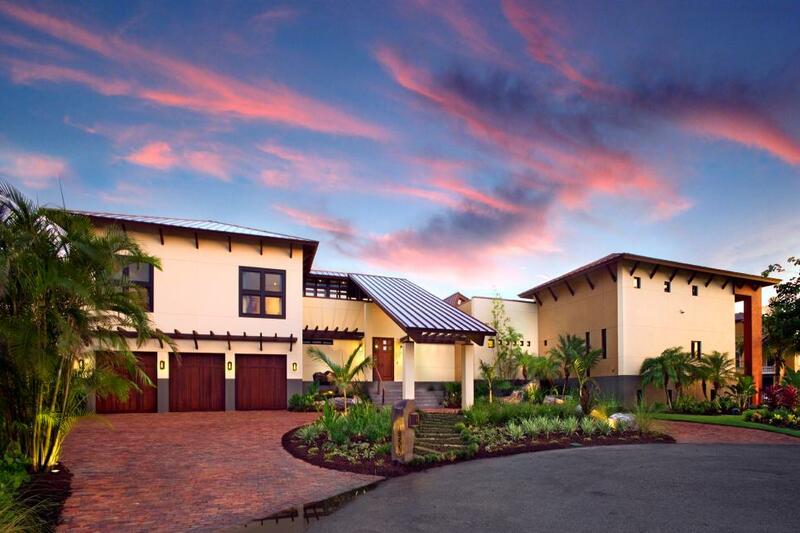 This home boasts a warm, sun-washed exterior and flat roofline for a classic Southwestern look. Bold colored patio furniture brightens the pool deck and provides shaded space for relaxation after a swim in the pool or dip in the hot tub. The gem of the patio is the swimming pool and hot tub. 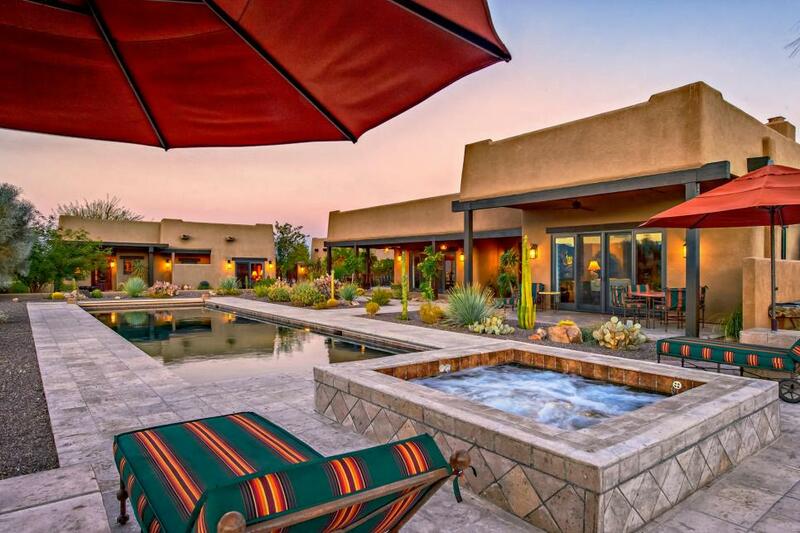 Surrounded by a mix of flagstone and natural stone with desert landscape views on all sides, it's like a magical oasis. 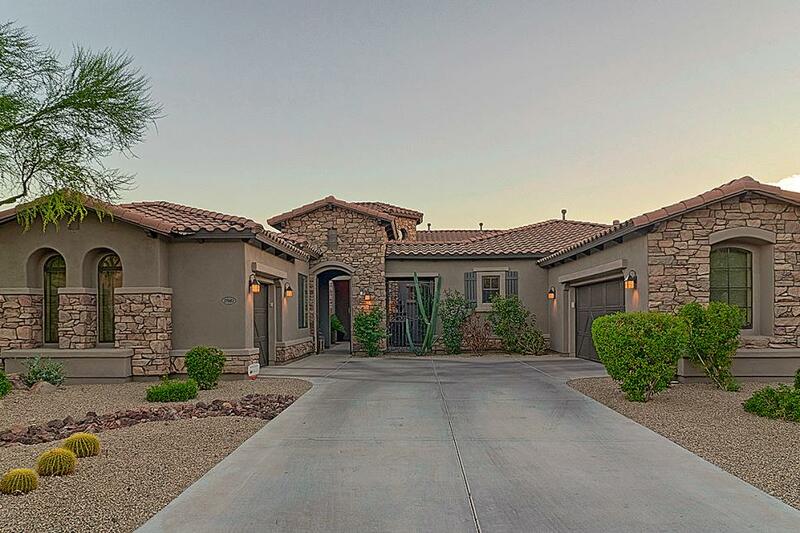 This southwestern home is designed for large families that want to entertain friends and extended family and prefer new trends, designs, floor plans and energy-efficient features. 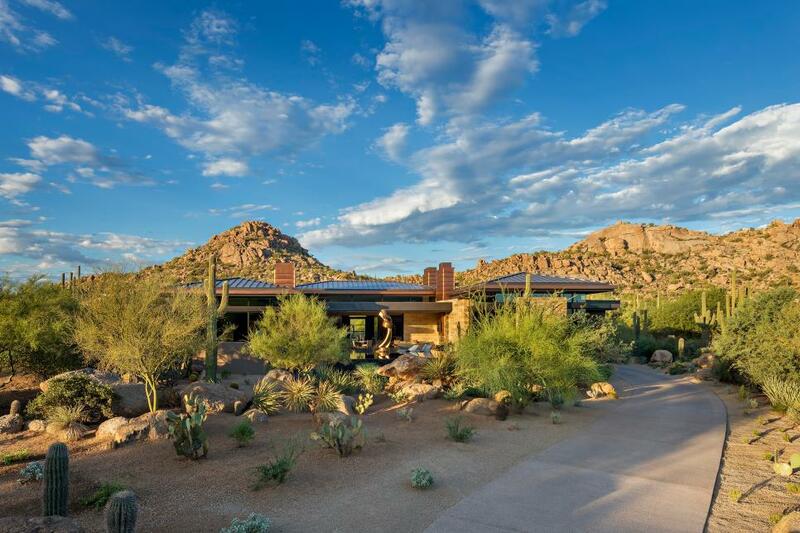 The exterior of this home draws its inspiration from the Southwestern tradition. Desert plants are found lining the entrance to this stark-white, moern oasis. 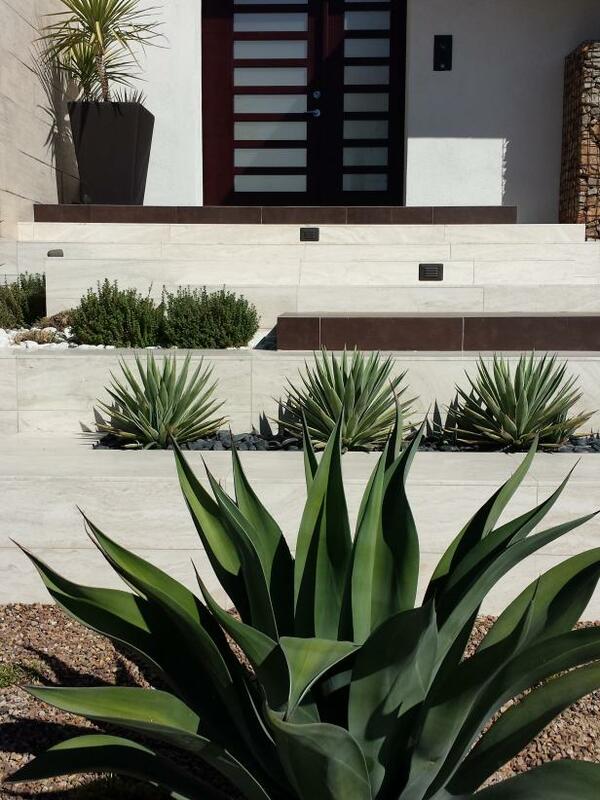 The stucco exterior complements Belgard retaining walls that line the landscaped side yard and stone walkway at the HGTV Dream Home 2010. Neutral tones and sharp lines create a sleek, modern look. 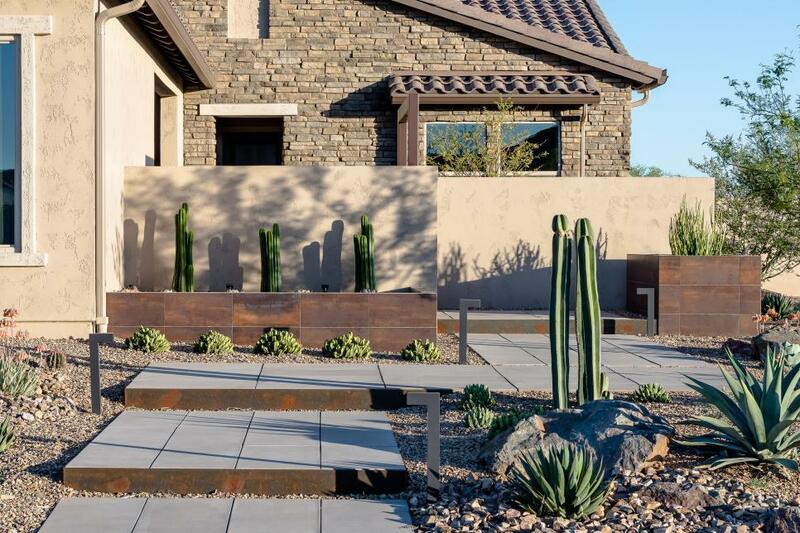 Low-water landscaping combines with sleek paver walkways and copper walls to create a rustic yet welcoming outdoor space. 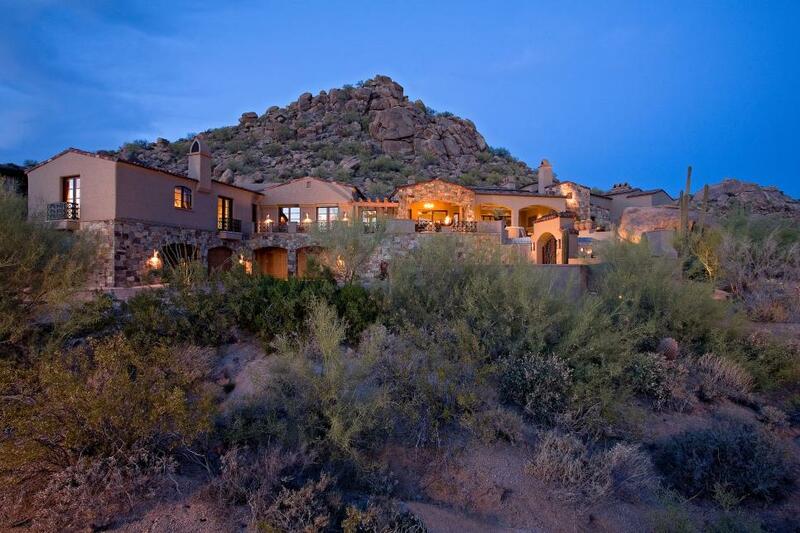 Stacked stone and stucco walls mix with terracotta roof tiles for a quintessential southwestern home. 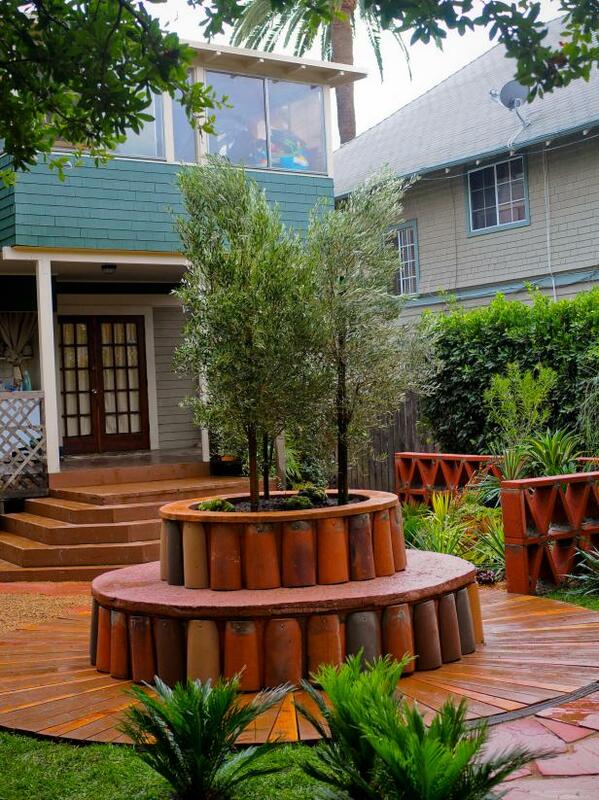 The designers of this beautiful Southwestern style landscape use natural colors to make the space standout. 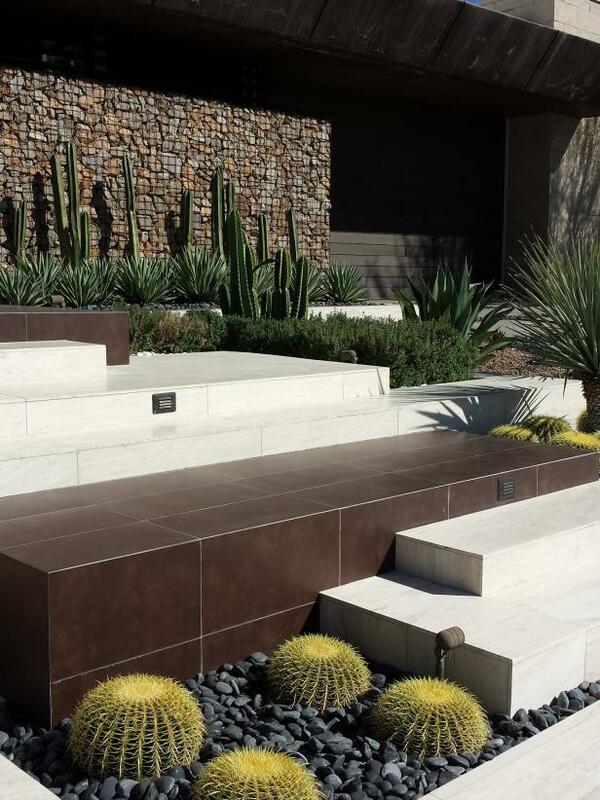 The brown hues of the rocks in the gabion wall and the tile accent steps compliment that natural green hues of the desert plants that surround them, making the landscape of this house match the natural landscape of the land that surrounds it. 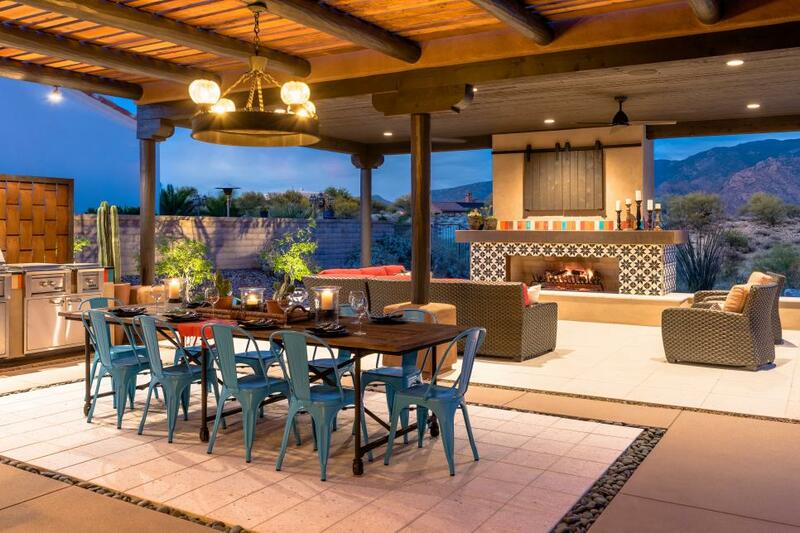 This Spanish-inspired patio is the ultimate entertaining space with a comfortable sofa, grilling station and countertop seating. A retractable awning and curtains provide control over the amount of sunlight that reaches the space.